You could count the classic coin plots on the fingers of one hand - until now: add The Portable Hole to that list. This routine is the epitome of David Roth's genius as both a creator and synthesizer, and he's used it both in his professional act and lecture and it is world famous. What you're about to read is the height of coin magic - the state of the art. The routine itself is fairly long and complex, and will be difficult to master. Only a few can and will do it. The props and conditions are simple. You must be seated at a table opposite the audience (though an alternate standup method will be given afterward). There must be a close-up mat on the table directly in front of you. You also need four half dollars, a purse frame, and a felt hole that's 3-7/8" in diameter - actual size reproduced directly below from Roth's own hole. In order to save time when you're actually learning the routine I want to teach you two moves in advance. You should have already mastered The Shuttle Pass, Frontal Imp Pass, and some form of the Retention Pass (the ones taught in this book are fine). The first move you'll learn now is Marla's Spider Grip Vanish. Hold a coin in Spellbound position at your left fingertips. Hold your right hand palm toward you and move it in front of the coin (fig. 231). Move your right thumb onto the inner side of the coin and actually take it with your right hand (fig. 232). In other words, this is what you would do if you were doing what appeared to be a French Drop, but really took the coin instead. As soon as your right hand begins moving upward with the coin concealed behind its fingers your left hand turns palm down, curling its second, third, and pinky fingers. Your left thumb and first finger stick out awkwardly so the hand looks suspicious (fig. 233). Make your left hand look cramped - as if it concealed the coin (this is a feint). At the same time your right hand turns palm down, its fingers loosely curled, the coin in fingertip rest. Raise your right hand and move it slightly forward (there will be a logical action for this during the routine) simultaneously pushing the coin into classic palm. 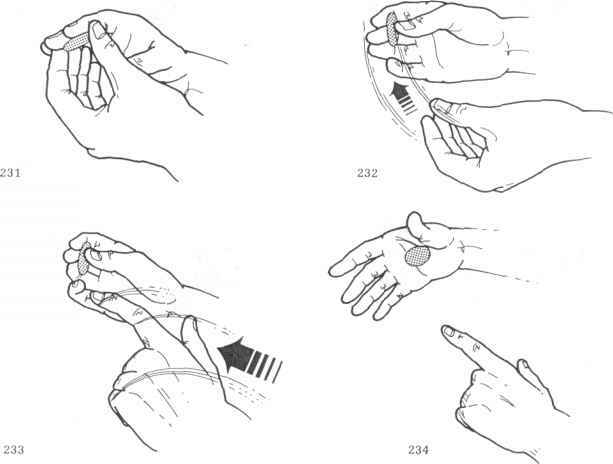 Make a small tossing motion downward and spread your right fingers wide so that even though the hand is palm down it will appear empty (you need a good classic palm for this) (fig. 234). Turn your left hand palm up and open it to show that, contrary to what the spectators may have suspected, the coin is not there, either. The second move you should learn now is The Kick Move. The idea of kicking one object beneath another is not new, but the technique and its applications are strictly David's. Place the felt hole on the mat and flatten it completely with your left hand. Place one of the coins directly beside it, about a quarter inch to the right (fig. 235). Your palm-down left hand, fingers together and straight, descends over the coin so that it's directly to the left of your thumb (fig. 236) in which the coin can be seen through the hand). Note that your hand is cupped very slightly so that it doesn't actually press on the coin. Also make sure that your thumb is relaxed and, while it is not sticking out to the side, it is a little away from the side of your hand. 1) Your left thumb snaps to the left, kicking (not pushing!) the coin to the left. It will slide beneath the hole (fig. 237). It'll take a bit of practice so you can gauge exactly how hard to kick it - if it doesn't quite slide under all the way then kick it harder, if it flies out from beneath the left side of the hole then kick it lighter. Other than your left thumb's action your hand does not move yet. 2) Start to lift your hand straight up, keeping it palm down, moving your thumb behind your fingertips as if holding the coin there (fig. 238). 3) Begin to turn your hand palm up and stop when your fingers are pointing directly to the right (fig. 239). 4) Continue turning your hand palm up, at the same time curling your fingers into a fist as if you've let the coin drop inside it (fig. 240). The Kick Move must be done as if you were really picking up the coin - smoothly and rapidly, all the steps combining effortlessly into one fluid motion. To set up for the routine, align the inner edge of the mat with the table edge and insert a portion of the hole beneath it directly in front of you so that most of it hangs behind the table (see next illustration). The purse frame rests on the table with the curled sides (on which the bag would normally hang) pointing toward the audience. Finger palm two coins in your left hand. The other two coins are in your right hand - one in finger palm, the other in classic palm. Both hands rest in relaxed fists on the table near the edge (fig. 241). 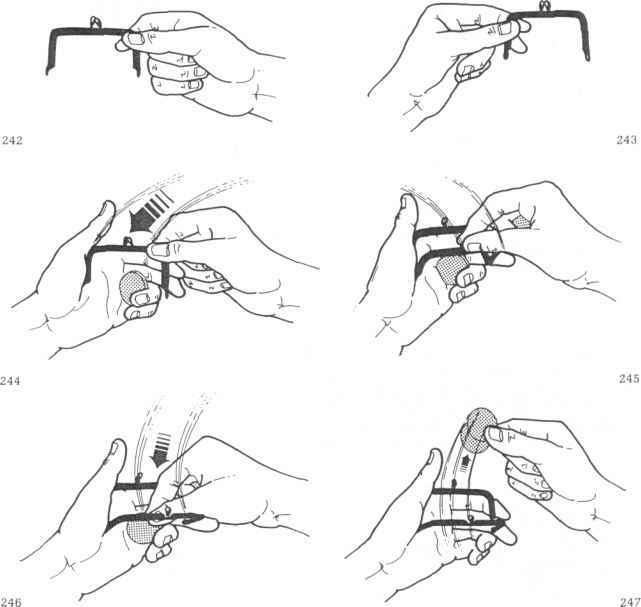 in production position, wedged between your thumb base and first and second fingers (fig. 244). "See anything? Hear anything? But it doesn't matter because I con open it up and take things out anyway." Suit action to words. Your right thumb and first finger snap open the frame (fig. 245), reach inside, and grasp the upper ends of the two finger palmed coins (fig. 246). Pull them out, spreading them (fig. 247). Toss them onto the table and continue, "Those ore half dollars from a purse without a bag." Your right hand immediately returns to the purse and partially closes it, pulling it to the right (fig. 248). Snap the purse shut with the thumbs and first fingers of both hands at either ends. Lift the frame with your right hand. Your left hand arranges the two tabled coins as in Figure 249, and then moves beneath the frame. Extend your left first finger upward and wiggle it where the bag should be, saying, "Nothing to see..." (fig. 250). Raise the frame a bit, toward your right ear, and say, ". . nothing to hear, no bag,"
"But if you want to see it again, that's okay too." Place the frame back into production position in your left hand and snap it open with your right thumb and first finger. As you say, "I have another one right here," look downward into the frame and lower your right hand a bit (fig. 251). Move your right thumb onto the finger palmed coin. Raise your right hand, your thumb pushing the coin to just inside your fingertips (fig. 252). Insert your fingers into the purse and cleanly pull out the coin, pushing it past your fingertips with your thumb. Drop the coin onto the table, inward of the two already there (fig. 253). Snap the frame shut and place it, with your right hand, onto the table to your right with the "open" side toward you (fig. 254). At the same time your left hand picks up the just-produced coin and maneuvers it into palm-up finger palm in position for the Shuttle Pass. Do that move, apparently taking the coin from your right hand. Tap the coin on the mat where the frame's bag should be as you say, "That's the third half dollar from the purse without a bag" (fig. 255). Place that coin just to the left of the other two (fig. 256). Pickup the frame with your right hand, saying," Nothing to see, or hear." Transfer the frame to bet wee n your left thumb and first finger for a moment, "Sometimes people ask me if I keep things in the purse beside coins. . . " Transfer the frame back to your right hand so that it can place the purse back into your left hand in production position. Continue, ". . and I do!" Snap open the purse with your right hand, and then make a palm-up gesture with it while your left hand drops to the table - just at the edge, as you say, "I keep something in here you wouldn't believe." Turn your right hand palm down and extend your thumb and first finger into the purse until they can grasp the felt hole (fig. 257). Pull the hole up and out of the frame (fig. 258). 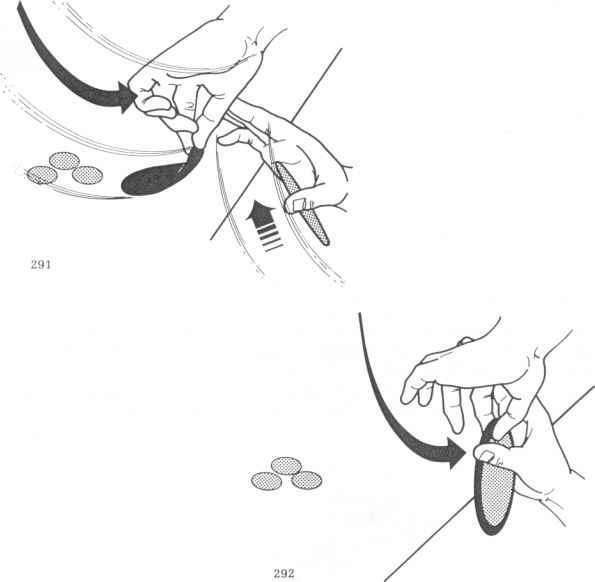 Immediately let it flop open flatly on your right hand (fig. 259). Say, "Have you ever seen one of those before? That's a portable hole." Your left hand turns palm down pushing the frame partially closed against the table (fig. 260). Leave the frame there and lift your palm-down left hand slightly. Two things happen simultaneously - your left hand turns palm up and your right hand turns palm down laying the hole over your left fingers (fig. 261). You must time this so that the coin which is finger palmed in your left hand isn't prematurely exposed. beneath the hole - and also beneath the coin in left-hand finger palm (fig. 263). Lower your right first and second fingers onto the hole directly over the coin and lift it. Your thumb slides the coin upward as your right hand bends at the wrist so the hole hangs downward (fig. 264). Note that the coin is now near the upper edge of the hole. Point toward the center of the hole with your left first finger and say,".. actually goes into the hole. It's very convenient." Your left hand turns palm down and takes the hole between thumb and first finger exactly the same way your right hand holds it (fig. 265). Place the hole onto the table just to the left of the row of coins (fig. 266). 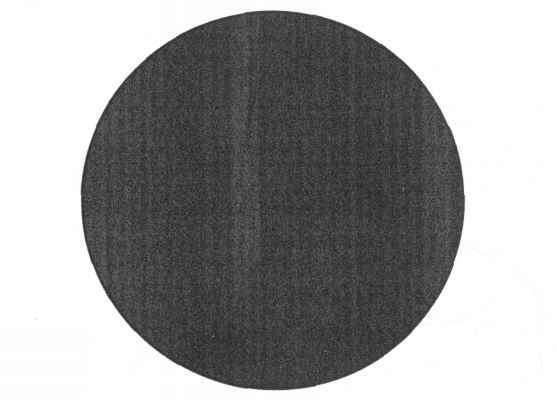 Note that the concealed coin is beneath the inner edge of the hole. "Of course I can tell by the look in your eye that you don't believe a word of this - I didn't either ... until I saw it." Both hands pick up the purse and, holding it at either end, snap it shut. Your right hand lays the purse on the table to your right, open side toward you (fig. 267). Arrange the three coins in a neat row - which is just to allow you to make sure that the left-end coin is in position for The Kick Move (about a quarter inch to the hole's left as already described). "So let me show you a little thing with a portable hole, a bagless purse, and three coins. Coin number one: the idea is simple, and when I say simple I mean to just drop the coin right into the hole. Gone without a trace, lost forever." Here's the action to go with those words. Your right hand picks up the right-end coin and does a Retention Pass into your left hand. 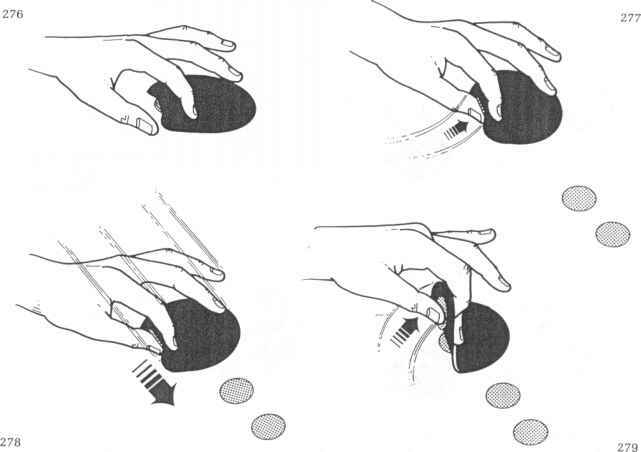 As soon as your left fingers have closed your right hand begins a count er-clock wise circular swing first toward you and then to the right - over the table edge where it laps the coin simply by letting it slide off the fingertips (fig. 268). 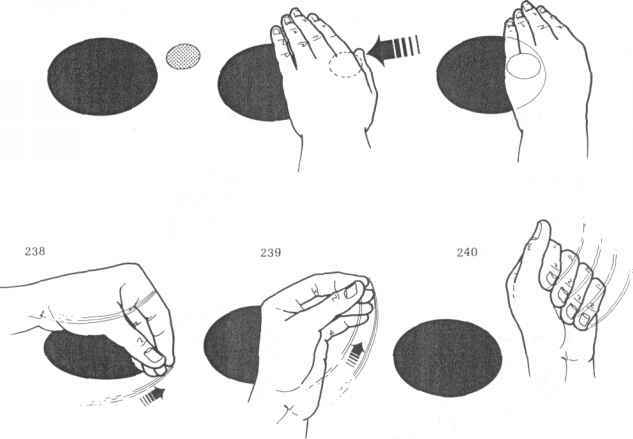 Without pausing your right hand continues moving, now outward and around until it waves over your left hand again (fig. 269). Move your palm-up left fist over the hole, crumple your fingers and slowly open them at the same time pretending to toss the coin downward into the hole (fig. 270). "That's one in the hole and two coins left and I'll try it again with coin number two which goes the same way (is coin [lumber one." As you say that your left hand does The Kick Move as described, moving over the hole in a fist afterward. Crumple your fingers and pretend to drop the coin into the hole as you open your hand. "You see I take them out of a bagless purse and drop them into a portable hole - Its very weird." "Once more the hard way in the other hand - watch it go, and it's gone." 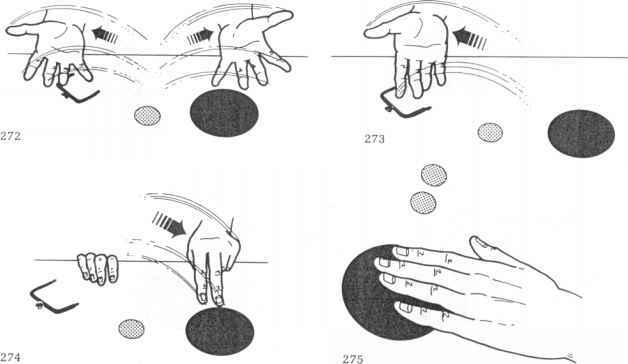 Vanish the third coin using Marla's Spider Grip Vanish as taught, your right hand (with the coin in classic palm) moving over the hole, opening its fingers with a downward tossing motion (fig. 271). Your left hand turns palm up as a finishing gesture. "The strange thing is every time I drop them in the hole they appear back inside the purse. Even though there's no bag the coins come back anyway." Your right hand (with a coin in classic palm) picks up the frame and puts it into production position in your left hand. Snap it open with your right thumb and first finger. Raise your left hand a bit and peer inside the frame. 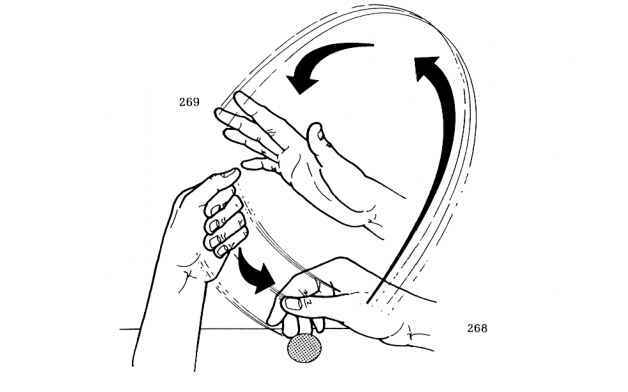 At the same time drop your right hand and allow the classic palmed coin to drop to fingertip rest. Raise your right hand and insert your fingertips into the open frame and cleanly and quickly push the coin past your fingertips and pull it out of the frame. As you finish the sentence, saying, ". . even though there's no bag the coins come back. . . " your right hand drops the coin on the table, snaps the purse shut, and places it back in its previous position on the table to your right. As you say, "...anyway," do a large palm-up gesture with both hands - the first movement of the Frontal Imp Pass (fig. 272). Drop your hands into your lap - your left hand immediately picks up the coin already there. As you say, "Of course that's only one coin out of the purse. . . " your right hand comes up from beneath the table and gestures palmup toward the frame (fig. 273). Your right hand turns palm down and drops onto the table in Frontal Imp Pass position. As you finish the sentence, saying ". 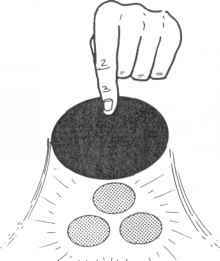 . . that still leaves two coins left in the hole," your left hand loads the coin into right hand thumb palm and immediately moves upward with two fingers extended downward over the hole (fig. 274). Turn your left hand palm up to show it empty, then let it drop onto the table in the same position as your right hand. Say, "But if you think about it, even one coin coming. .." both hands pull themselves onto the table in relaxed fists, the coin in your right hand transferred to fingertip rest. Your left hand immediately moves forward and picks up the visible coin from the table and holds it in palm-up finger palm. As you finish the sentence, saying ". . out of a purse without a bag is rather bizarre," do The Shuttle Pass, your right hand apparently taking the coin and tapping the empty space near the frame where the bag should be. Your right hand drops the coin onto the table beside the hole (where the row was before). Continue, ". . . but it isn't as good as two, so there's two." As you talk your right hand lifts the frame and places it into left-hand production position. Snap it open, reach inside and cleanly pull the coin that's finger palmed in your left hand out. Place that coin beside the one already on the table, snap the frame shut, and place it back on the table as before. (fig. 280). Do a Retention Pass under cover of the lifted hole, your right hand retaining the coin in fingertip rest. Immediately lift the hole straight up with your left hand, leaving the coin that was beneath your second finger on the table, and say, ". . . you'd see me do it!" Lift that coin with your right hand between thumb and first finger, your left hand laying the hole back on the table afterward. Drop the coin into palm-up finger palm in your left hand and do a Shuttle Pass, your right hand apparently taking the coin and tapping the bagless area of the frame as you say, "And I already told you they're not under the hole -they're inside the purse." Your right hand tables its coin beside the other visible coin on the table. Your right hand lifts the frame as you say, "You can't see them or hear them.. . ." Put the frame into production position in your left hand, snap it open, and cleanly remove the coin that's in left-hand finger palm as you continue, ". . but they're in there, you just have to know how to take them out. "Table the coin beside the other two and place the frame back in its position on the table. "So that's three coins, gone and back, dropped into a portable hole." And now, just for you, I'll do the whole thing one more time." The props are layed out exactly as they were at the end of the opening sequence, just before you began Part One. Say, "You remember at the be-ginning I just took the first coin and dropped it right into the portable hole." Your right hand lifts the coin at the right end of the row in position for a Retention Pass but you're going to do it a bit differently. Hold your left hand palm down, fingers extended and slightly curled, thumb behind them, and move it beside your right hand (fig. 281). Do a fingertip-to-fingertip Retention Pass, i.e., your right hand moves the coin behind your left fingers, your hands forming a V (fig. 282). 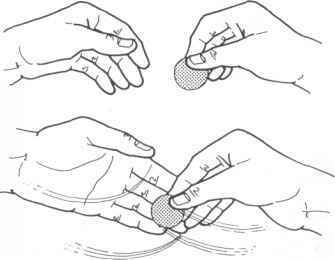 Do the move, pulling the coin back to fingertip rest, your left fingers moving away as if they held the coin. Your left hand moves directly over the hole and opens to show itself empty. At the same time your right hand settles to the table in a relaxed fist. The above patter line should be said as you actually vanish the coin (like narration). "No, I didn't lift the hole.. . ." Your left hand turns palm down as you lower your first finger onto the outer end of the coin hidden beneath the inner end of the hole. Press lightly downward so the coin's inner end rises and your thumb can slide beneath it. Now, at the precise moment that you say, "lif t the hole, " lift the hole letting it dangle downward (fig. 283). Continue, ". . A didn't take any coins and hide them under tile hole. . . ." Extend your right first finger and, with it, slide the visible left-end coin beneath the hole - near its lef t side (fig. 284). It's important that the coin is as far left as possible and still be completely covered by the hole once it's lowered. Continue, ". . . I simply took the coin and dropped it into the hole. . . . " Lower your lef t hand so t he ou ter side of the hole is draped on the table. Your left second finger descends onto the coin that you've openly pushed beneath the hole (fig. 285). Your right hand moves behind the lifted portion of the hole and pushes the coin that's in fingertip rest to the fingertips and openly brings it out. Your left hand immediately lowers the hole and pats it flat while your right hand tables its coin beside the hole in position for The Kick Move (fig. 286). Say, ". . . It was very very simple and it looked just like that." Move your left hand over the left-end coin and do The Kick Move as already taught, propelling the coin beneath the hole as you apparently pick it up, hold it over the hole, and vanish it as you drop it into the hole. "Of course now you know that I take them out of a bagless purse and drop them into a portable hole. Once more, the hard way, long distance - very difficult like that, but it still goes into the hole." Your right hand lifts the remaining coin. Do the same sequence that you did at the very beginning of Part One, where you did a Retention Pass into your left hand and then waved your right hand in a large counter-clockwise circle, lapping the coin (that's "the hard way, long distance" in the patter). Wave your right hand over your left hand, which opens over the hole vanishing the coin. "Of course there's one more place they could be, and that's under the hole." As you say that your left thumb and first finger cleanly slide back the hole revealing the three coins (fig. 287). David emphasized to me that this is definitely not as clean as the handling using lapping - but here, as is already obvious, you can be standing throughout the routine. This is extremely difficult, so be prepared. This sequence replaces Part One and most of Part Two, and you must set up as described after the opening sequence. That is, one coin concealed beneath the inner side of the hole, three coins in a horizontal row just to the right of the hole, each coin about an inch and a half from the hole. The frame rests, closed, on the table to your right, open end toward you. Turn your left hand palm down and lower it over the left-end coin. Do The Kick Move, propelling the coin beneath the hole while apparently picking it up. Vanish the coin over the hole. Your right hand lifts the right-end coin and does a Retention Pass into your left hand. Your right hand settles into a fist on the table for a moment afterward, the coin in fingertip rest. As you raise your right hand to wave it over your left hand transfer the coin to classic palm. Your left hand vanishes the coin over the hole. Your left hand picks up the remaining coin in palm-up finger palm. Do a Shuttle Pass, apparently taking the coin with your right hand - tap the bagless area of the purse. Do a Retention Pass into your left hand, retaining the coin in righthand fingertip rest. Be careful to keep your left fingers curled slightly during this so you don't expose the finger palmed coin. Make a gesture with your right hand and transfer the coin to classic palm. Open your left hand to show that the coin is still there, and then drop it on the table. Pick it up with your right hand and place it on your left fingertips in Spellbound position for The Thumb Palm Spider Vanish. Like this. Once the coin is in position your right first and second fingers move in front of it, thumb behind (fig. 288). Take the coin with your right hand, turning your left hand palm down and awkwardly extending your left first finger and thumb so the hand appears cramped. Raise your right hand, your first and second fingers sliding the coin back into thumb palm (as already taught in the first coin switch in Wild Coin No. 1). Move your right hand over the hole and open your fingers as wide as you can while still retaining both coins - one in classic palm and the other in thumb palm (Fig. 289). Note that a small fold of flesh should automatically separate the coins if you've done the moves properly. Your right hand settles back to the table in a relaxed fist and transfers the coin that's in thumb palm to fingertip rest. At the same time your left hand turns palm up to show that it is empty. 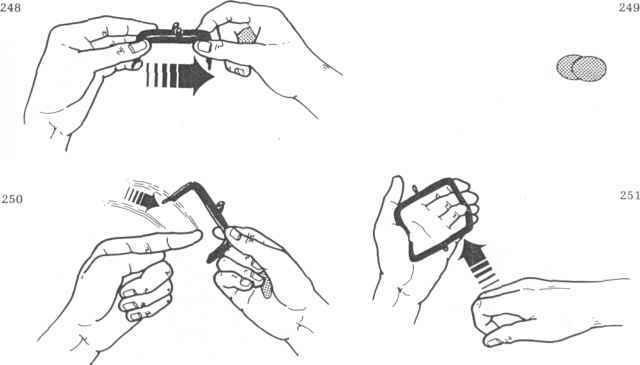 Your right thumb and first finger pick up the frame and place it into production position in your left hand. Snap it open and reach inside, pushing the coin to your fingertips and plucking it out of the purse. Table it, snap the purse shut, and place it aside to the right. Your left hand picks up the just-tabled coin in position for a Shuttle Pass. Do the move, apparently taking the coin with your right hand to tap the bagless area of the frame. Place the coin on the table where the row of coins was before. Your right hand lifts the frame ("Nothing to see, nothing to hear"), places it into production position in your left hand, and opens it. Cleanly remove the coin that's in left-hand finger palm and table it beside the other coin. Snap the frame shut and table it. You're now in exactly the same position that you would be in Part Two just before reproducing the third coin ("This guy thought I kept them under the hole," etc. ), so continue from there as described. When you reach the end of Part Three and have to completely vanish the last coin you cannot, as in the regular routine, lap it. Any of the "complete" vanishes in Bobo would be appropriate, or you could sleeve the coin. In Addition: I know you must be confused if you've just read the routine for the first, or even second, time. My head is still spinning from writing it! David used to end the routine by producing a giant coin from beneath the hole after first revealing the three regular coins. There are no effects using giant coins in this book because I share David's opinion that they tend to detract from the overall effect. In other words, if you produce the giant coin at the end of the routine that is all the audience will remember. You might as well not do the rest of the routine because it's immediately forgotten once the giant coin is produced. Since David was the first to develop and use the felt hole, and also the first to produce a giant coin from beneath it, I'm going to record his method (which is far superior to any others, published or not). The only preparation is to have a giant coin in your lap throughout the routine. It should be placed so that it doesn't interfere with any of the other lapping and retrieving that goes on. Do the routine as described until the end of Part Three. Vanish and lap the last coin, show both hands empty, and pause. Patter and let your right hand drop into your lap. Your left hand grasps the inner end of the hole between thumb (beneath), and first and second fingers (above) and pulls it toward you revealing the three coins. Back track for a moment. After your right hand drops into your lap it picks up the giant coin in Tenkai Palm (fig. 290). As your left hand pulls the hole toward you begin to raise your right hand until it's above the table edge. You must time this so that your left hand meets your right hand just as it rises above the table, your right hand bending back at the wrist (fig. 291). 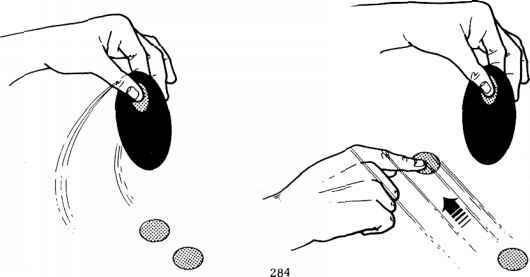 Your left hand positions the hole directly in front of the coin and immediately grasps the coin between thumb and fingers (fig. 292). Move your left hand forward and place the hole (with the coin now beneath it) on the table, your right hand turning palm up in a gesture. You have perfect cover for the load because all eyes will be on the three coins on the left. Pause for another moment, patter about losing things in the hole, and cleanly draw the hole back to reveal the giant coin. Resist temptation - don't use this! I know that sounds crazy, but try it out once or twice just to convince yourself that the routine is better without it. Which hole do i finger? How do drawing learn easy magic coin? Where to buy a portable hole coin magic?